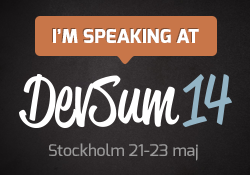 I will be at DevSum 14 in Stockholm soon. Finally I get to do a session on a topic I’ve ben dying to do for a quite a while! The topic is “Azure the Stories and the Secrets”. I originally thought I’d put together my own tips and trix and learnings from working with real Azure customer cases. There will be that in the presentation for sure. But then I suddenly had an epiphany: I asked my fellow Azure MVPs on our internal alias at Microsoft for their input as well. I find myself swarmed with great advice from the best-of the best-of the best of Azure! Which is a great thing. But with great power comes great responsibility . Now I have to do my fellow Azurists justice with my prezo! Exciting times and the session will be so very great to give!